On behalf of our client, Lucky Air, we are pleased to accept applications for A320 Captains, A330 Captains and B737NG Captains, with a variety of rostering options. Kunming, is a beautiful city located in the southern central part of China in the Yunnan Province close to the Thai, Vietnamese and Laos borders. The Kunming is known as the spring city due to its year round mild climate and boasts one of the lowest air pollution levels in China. Kunming has a vibrant expat community and one of the lowest costs of living compared to that of the big cities on the east coast. Lucky Air launched in 2006 and operates to over 80 domestic destinations and over 20 international destinations. Lucky Air plans to introduce 12 new aircraft per year and to expand to its international network with these new aircraft. New destinations include Helsinki, Moscow and St Petersburg. 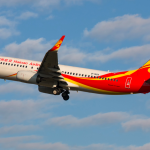 Lucky Air operates from the newly opened, ultra modern Kunming Changshui International Airport. Lucky Air is part of the Hainan group, offering progressive foreign pilot employment options including a variety of rostering options to accommodate commuting and residential employment, including a flexible commuting option work 182 days per year. Lucky Air will contact Flightdeck to advise the outcome of the screening process and to request your availability to attend the selection process. The next stage of of the employment process is a CAAC Simulator Check.